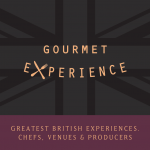 Uk's finest chefs, venues & Xperiences. At 16 years old, Cambridgeshire-born Callum turned down an army career in favour of a culinary path; he was inspired by the county’s wealth of home-grown produce. 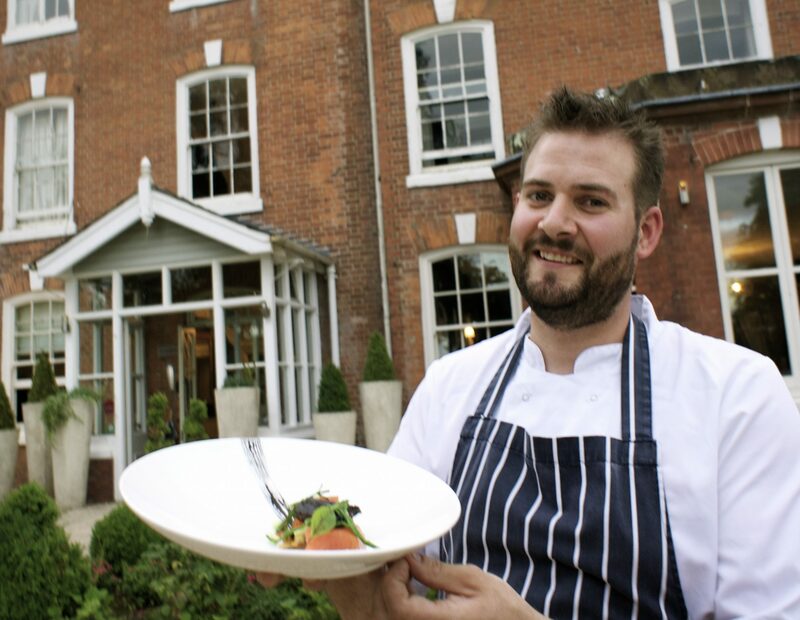 Now happily settled as head chef at Verzon House Hotel, in bountiful Herefordshire, his cheffing adventure has seen him learn his skills from some of the world’s best chefs. Learning the trade in Michelin-starred restaurants, Callum made an impression on Michel Roux Jnr during a week’s trial at London’s top class French fine dining restaurant Le Gavroche before being offered a year’s experience at the three-Michelin-star restaurant. He then ventured north to worked at Northcote, near Blackburn, owned by Michelin-star chef Nigel Haworth. Tasting the finest things of life from an early age gave Callum an enthusiasm and passion for quality and freshness which still drives him today in the kitchen at The Verzon. Callum was inpired to move to quieter lifestyle in Herefordshire through his passion for food provenance. He shares a passion for local fare with Verzon owner Kate Chase, who is part of the famous Chase Distillery family farm where they make multi-award-winning vodkas and gins. Callum’s style of cuisine is classic dining with a modern twist made with produce from the heart of Herefordshire. He enjoys reaping the benefits of Herefordshire’s world-renowned beef, apples and beers. Callum’s menus are a taste of Herefordshire, using local game, wild mushrooms and sourcing all ingredients from within the county is what makes them extra special. He has led the restaurant team to win two AA Rosettes for culinary excellence. Passionate about their local terroir, Herefordshire farmers and their passion to provide outstanding ingredients. Owned and run by the equally passionate Kate Chase, of Chase Distillery. Melt the butter for the asparagus mousse in a pan and add the asparagus and salt. Cover the pan and cook for three to four minutes. When the asparagus looks lighter in colour, pour in the cream and continue to cook for another minute. Pour into a food processor and add the spinach; blend for two minutes until smooth. Pass the mixture through a sieve and allow to cool slightly. In a pan, bring the water to the boil and add the soaked gelatine leaves. Stir to dissolve and set aside in a large bowl. Add the lemon juice to the egg whites and whip to a stiff peak. Fold the gelatine through the asparagus purée, ensuring it is fully incorporated, and add half of the whipped egg white. When the egg white becomes less visible fold in the remaining egg white. Once combined, pour into moulds lined with cling film, smoothing the top with the back of a knife, and refrigerate for three to four hours. In a bowl, combine the salt and water for the salt-baked beetroot. Place a layer of the mixture on to the bottom of a roasting tray. Top and tail the beetroots and place on to the tray. Take the rest of the salt mixture and shape around the beetroot to form a solid shell. Bake at 170°C for one hour and 20 minutes Remove from the oven and allow to cool in the salt crust. To make the beetroot crisps, lay the beetroot on to a tray and lightly sprinkle with salt. Leave for ten minutes to allow the moisture to seep out. Pat the beetroot dry and lay flat on to a sheet of greaseproof paper. Drizzle with olive oil and place another sheet of greaseproof paper on top. Bake the beetroot at 170°C for 20 minutes until crisp. Put the sugar and water for the onion caramel into a heavy-based pan and bring to the boil over a medium heat. After three minutes the sugar will become a light, golden colour; once achieved, pour directly into a blender with the sliced onion and blitz for three to four minutes until smooth. Pass through a sieve and reserve in a container. Break the goat’s cheese down into small chunks in a bowl and cover with cling film for 20 minutes to bring the cheese to room temperature. Meanwhile, bring the cream to the boil in a heavy-based pan and pour the cream over the goat’s cheese. Whisk until smooth and reserve in a piping bag. To plate the dish, place a ring of asparagus mousse on the plate, cling film side up. Remove the cling film and lightly heat the side of the ring with a blowtorch to gently lift off. Pipe five or six mounds of the whipped goat’s cheese on to the plate and balance two beetroot crisps on top. Drizzle the asparagus spears in olive oil and carefully arrange around the mousse. 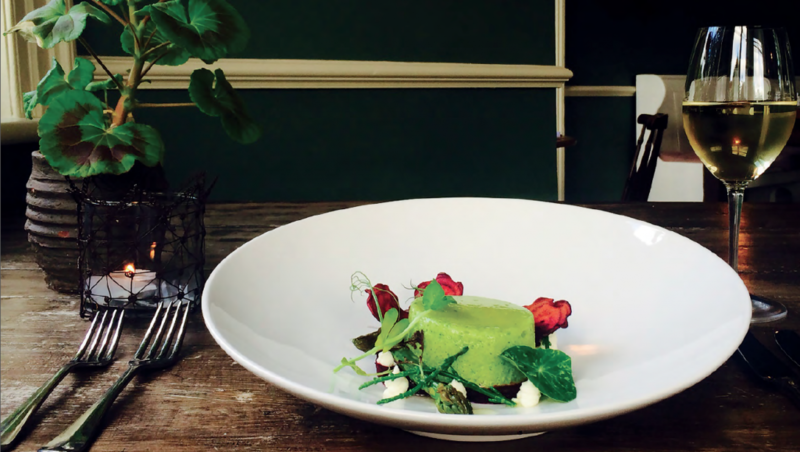 Using a dessert spoon, drizzle the onion caramel around the mousse and garnish with the baby watercress leaves. Finish the plate with a few truffle shavings if desired.